New software titles will be released for Nintendo Switch to satisfy everyone, from our game fans to family gamers. As shown, from February onward we will be releasing a wide variety of new software titles one after the next. More than 300 software titles are already available for Nintendo Switch from other software publishers. Early participation of many publishers has led to the release of software titles in a wide variety of genres. In addition to the packaged titles available in stores, many unique download-only titles have been released in Nintendo eShop, providing consumers with an even wider selection of software titles. 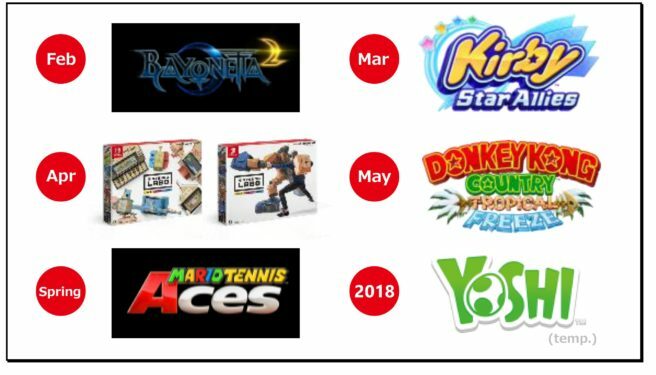 We believe that the availability of software titles will continue to accelerate as a result of the widespread acceptance of Nintendo Switch by other software publishers. In addition to the software titles you see here, a string of titles in a wide variety of genres will be released in the future.